I wish I could say "brrr", but it's SO hot right now! It's unseasonably warm here in Carmel, CA and it has been like 90 degrees! None of us have AC so it has been.. interesting. But that hasn't stopped me! 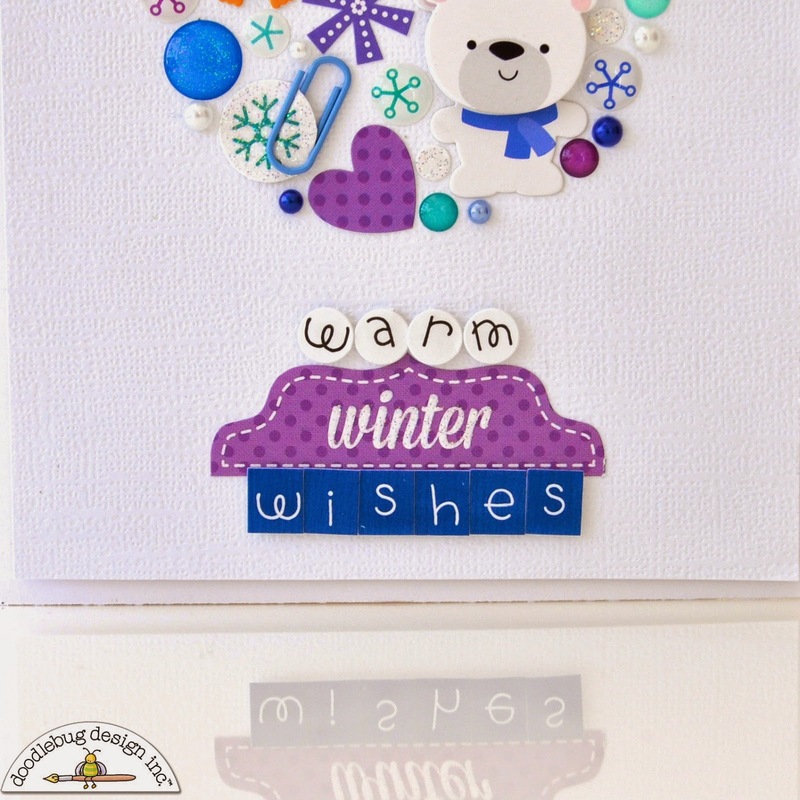 Courtney from Court's Crafts here with a card to share! I fell in love with the embellishments in this collection and wanted to showcase as many of them as possible! 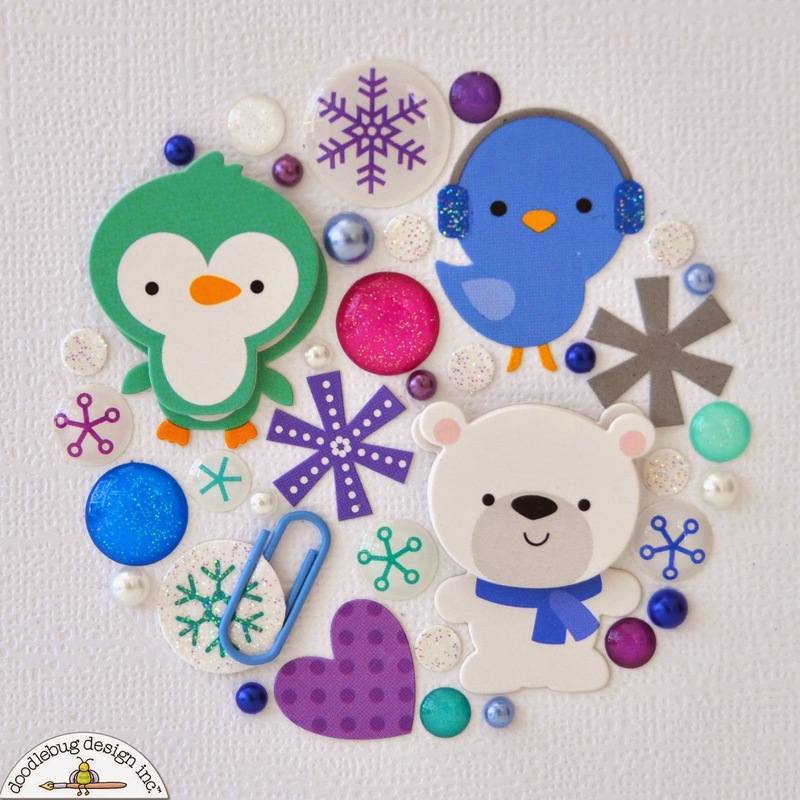 Frosty Friends is SUCH a darling collection! Doesn't it just scream "Frozen!?" Well, today I am channeling my inner (fellow DT member) Melinda Spinks and I created an embellishment cluster. The card is supposed be a decomposed snow globe. Can you see it? My little circle of love. Isn't. It. So. Cute.? I used Melinda's idea of putting down a circle and indenting around it slightly to give me my edge. You can see it slightly where the bird is top right and also bottom left. You cannot see it at all in person. You can also see the sparkles in the pink and dark blue sprinkles. The sentiment was made up of a section on the fancy frills (winter) and "warm" and "winter" are teensy type letters in lily white and blue jean. The glitter accents on this collection are AMAZING! Here is the sentiment and winter is covered in sugar coating. Scrumptious. I thought I would show you the overall dimension of the card. OMG this card is too cute! I love all that collage of beautiful details!!! great idea! I can see it! Beautiful card! Wow! Great card. I immediately thought Melinda when I first saw it. You have definitely conquered the collage style with these pretty little embellies and trims. 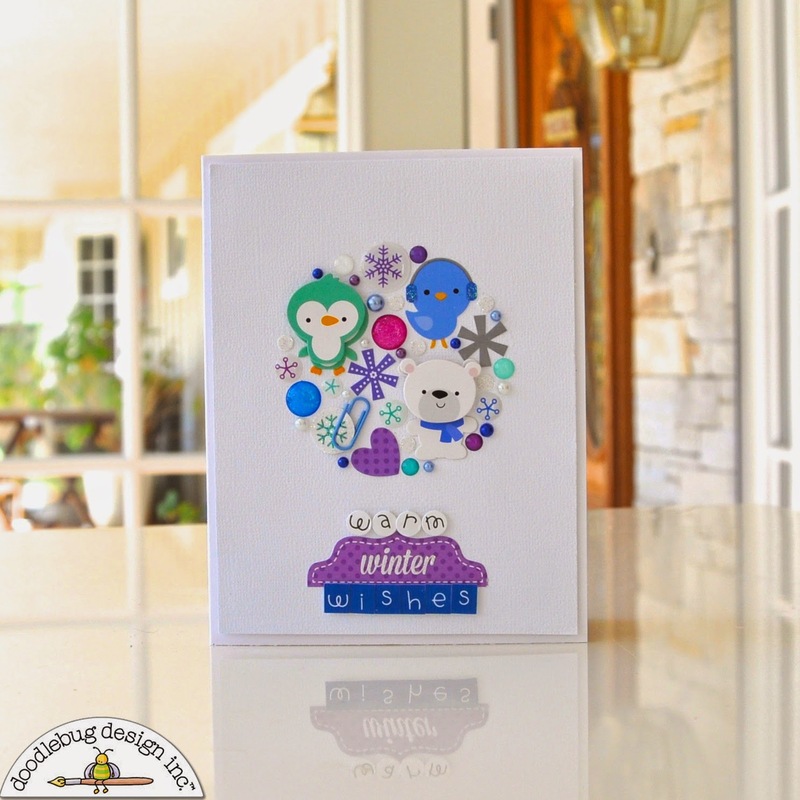 I love seeing card ideas with Doodlebug products. How clever to position the embellishments in a circular pattern. This card is sooo cute! I just love the sticker collage. ADORABLE card Courtney - LOVE IT ALL!!! 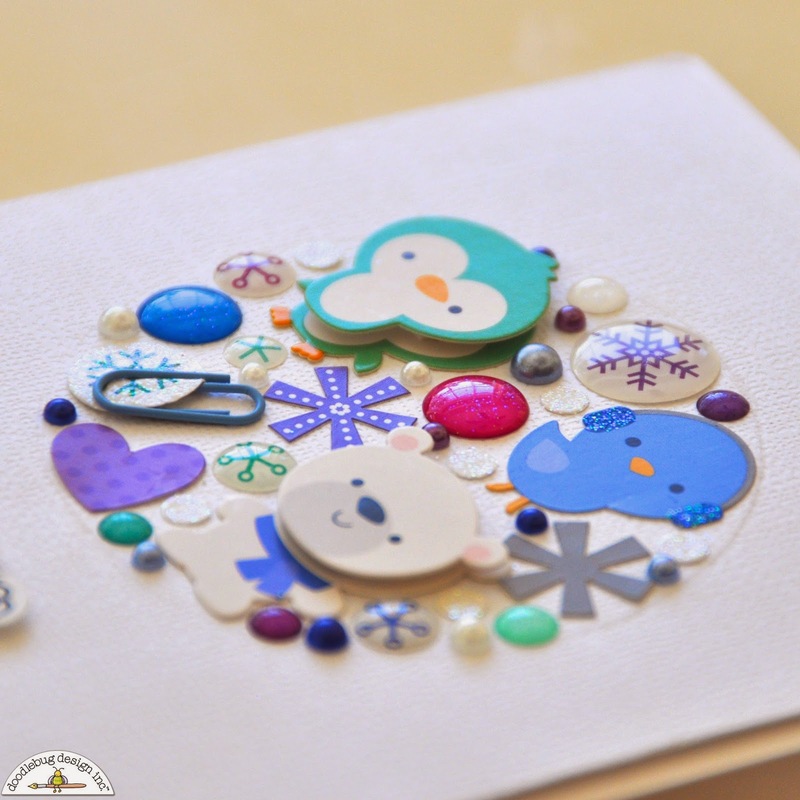 I pinned the close-up of the "snow globe" portion of Courtney's card - AWESOME dimension & detail - LOVE IT!!! 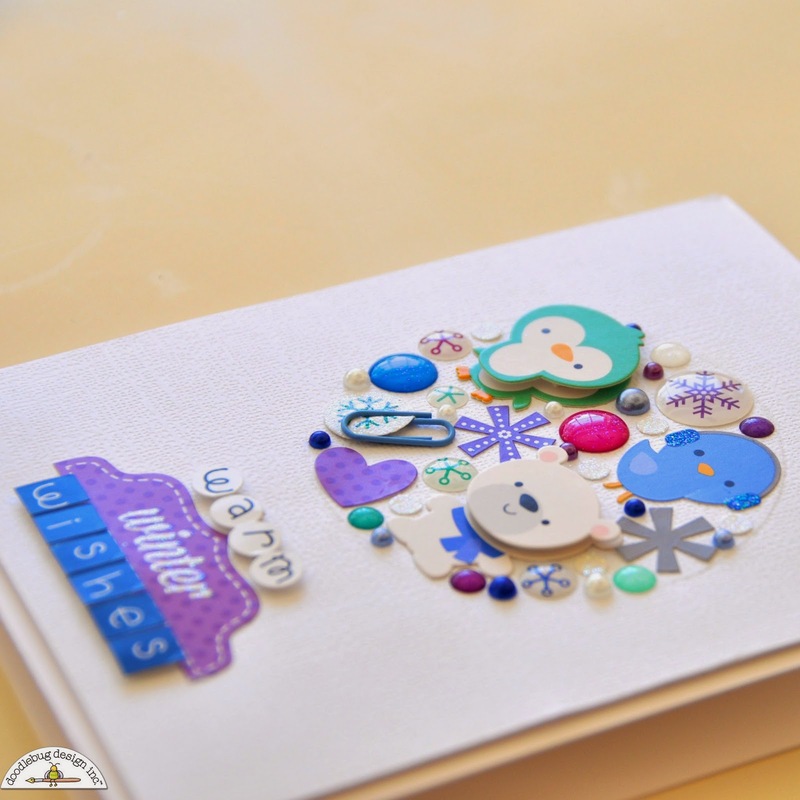 I pinned the close-up pic of the sentiment "base" of Courtney's card - fabulous sticker combo & dimension!!! OMG Your card is so stinkin' cute!!! WOW girl you totally rocked the Frosty Friends!! Your card is out of bounds cool!! I just love it and lucky....LUCKY .... person who gets it!! WOW!! This is really ADORABLE!! The details are Super cute & Fun!! what a FANTASTIC way to show off all of those cute embellies! LOVE this card - everything about it! J'adore cette carte, elle est géniale ! épinglée et partagée sur fb. Il love this card ; it's awesome ! Pinned and shared on FB.